Music movies seem to be Damien Chazelle’s thing. As a writer, he was behind the impressive Grand Piano. As a writer/director, he made the brilliant Whiplash. Now, he’s gone and made a full-fledged musical, a tribute to Los Angeles called La La Land. 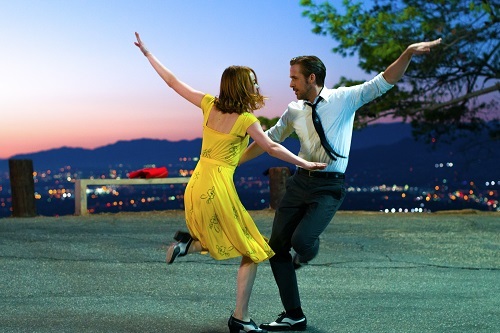 La La Land is about a struggling actress named Mia (Birdman‘s Emma Stone) who meets a down-on-his-luck pianist named Sebastian (Ryan Gosling from The Nice Guys) who longs to open a throwback jazz club. At first, the pair’s relationship gets off to a rocky start, but once they warm up to each other, Mia and Sebastian support and encourage each other as they work towards their dreams in the glittery glitz of Los Angeles. For a movie that channels the musicals of Hollywood’s classic years, La La Land has a very modern feel. Like Whiplash, the movie embraces Chazelle’s love and passion for jazz music, which gives it a retro-feel, but it is very much set in modern-day Los Angeles, even if it’s a very cleaned-up modern-day Los Angeles. As such, it’s more magical than realistic, but that just goes with the old Hollywood vibe. One thing is abundantly clear from La La Land, and that is that Whiplash was no fluke; Damien Chazelle knows how to make a movie. La La Land is nowhere near as intense as Whiplash, but that’s because it’s a completely different kind of movie. There’s more heart, more soul, and more magic. It’s also a much slicker production, with more polish and shine behind it. La La Land is an ambitious movie, and Chazelle pulls it off with style and grace. La La Land is a very sweet movie. It’s about hopes and dreams, aspirations and disappointments. It’s about making your own luck, and it’s also about selling out. It’s about opposites attracting. It’s about falling in love and falling out of love. And it does it all against the backdrop of a false Los Angeles, one where traffic jams and parking issues are just minor inconveniences instead of huge sources of stress. That’s what escapist fiction is all about, isn’t it? La La Land is one of those movies in which every shot is meticulously planned out. The camera of cinematographer Linus Sandgren (American Hustle, Joy) becomes its own character in the long follow shots, weaving its way in and out through wave after wave of dancers. The opening scene itself is an eight-minute (or so) one-shot song-and-dance number that takes place on a Hollywood freeway in the middle of rush hour traffic, motorists jumping and jigging around their cars (and around the camera). Later, there’s a scene with similar electricity at a pool party where the camera dives in and out of the water, ducking and dodging revelers everywhere as it goes. There are some scenes that don’t require hazard pay for the camera operators, though; sometimes, Sandgren will just set his camera up and let the scene unfold organically, the characters tap and jazz dancing around in a long master shot that lets them show off their moves. Whatever the scene demands, Sandgren delivers, and La La Land looks great because of it. There’s a moment in La La Land where musician John Legend, who plays an old friend who’s trying to persuade Sebastian to join his band, talks about how artists who are remembered are revolutionary and tries to convince Sebastian that as good as guys like Charles Mingus and Miles Davis were, if he wants to succeed in music he’ll have to break some new ground. La La Land could have benefitted from taking its own advice. That’s a long winded way of saying that, although it’s very skillfully composed and fits the film well, the music in La La Land is very derivative. 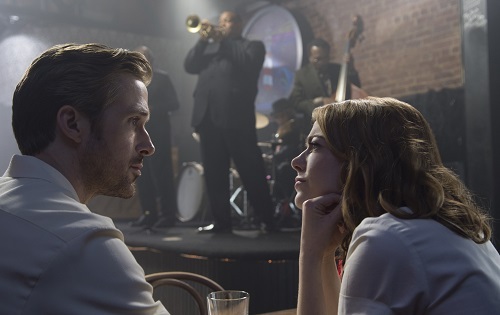 The musical numbers, composed by Chazelle’s go-to guy Justin Hurwitz (who also scored Whiplash) with lyrics provided by Benj Pasek and Justin Paul (the duo who wrote songs for Trolls), are elaborate and well-crafted, but there’s little-to-no new ground broken; even the jazz music choices that Sebastian loves dearly comes off as safe and sterile. 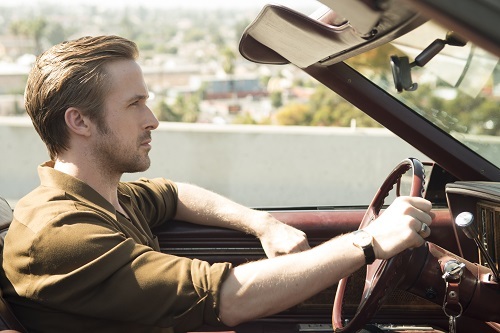 Now, Gosling and Stone have very…limited vocal abilities, so the composer was a bit handcuffed in that regard (one can only imagine what the soundtrack would be like if a real singer, someone like Anna Kendrick, had been cast). So, the songs in La La Land aren’t incredibly inventive, but that’s also kind of the point – given the tone and vibe of the film, the old Hollywood influence may very well have been a conscious choice. Either way, the music is very well written and, at times, is extremely catchy. It’s just nothing that hasn’t been heard before. But, if the biggest knock on La La Land is its music wearing its influences on its sleeve, it’s doing pretty well for itself in the cinematic universe.